Chris Woolley has been invited to be the feature soloist at this year’s Christmas Mission Concert. 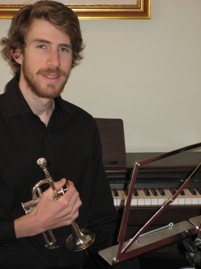 Chris Woolley began learning trumpet with David Gallaher while at secondary school. He began playing 3rd cornet at Addington in 2004 eventually moving to soprano in 2006. Chris played soprano cornet in the 2007 and 2008 New Zealand Youth Brass Bands and has been named in the 2009 band to tour Japan. In 2007, Chris came second in the open soprano championship and this year he won the title at the national championships. He is completing his Bachelor of Music in performance trumpet this year at the University of Canterbury studying with Iaan and Sarah Wilson. He is also finishing his Bachelor of Science in Biochemistry. Next year Chris intends to further his studies in trumpet at the New Zealand School of Music in Wellington.